I just don't know where to start, so I'm giving you all a heads up that this post might be a little random and scattered, but I know I need to write something now, because there is so much I want to write. This past Wednesday was a snowy day, so the kids and I decided to stay at home, rather than doing our normal library and grocery trip. We were having a great day and that afternoon's quiet time was turning out to be pretty productive for myself until I got "the call." One of my fellow North Iowa Bloggers, Donna, called me. I figured she was calling to let me know that our group wasn't going to meet for our supper and local business tour that night anymore because of the weather, but instead I heard a quiver in her voice and I could hear tears in her eyes. I thought what happened? 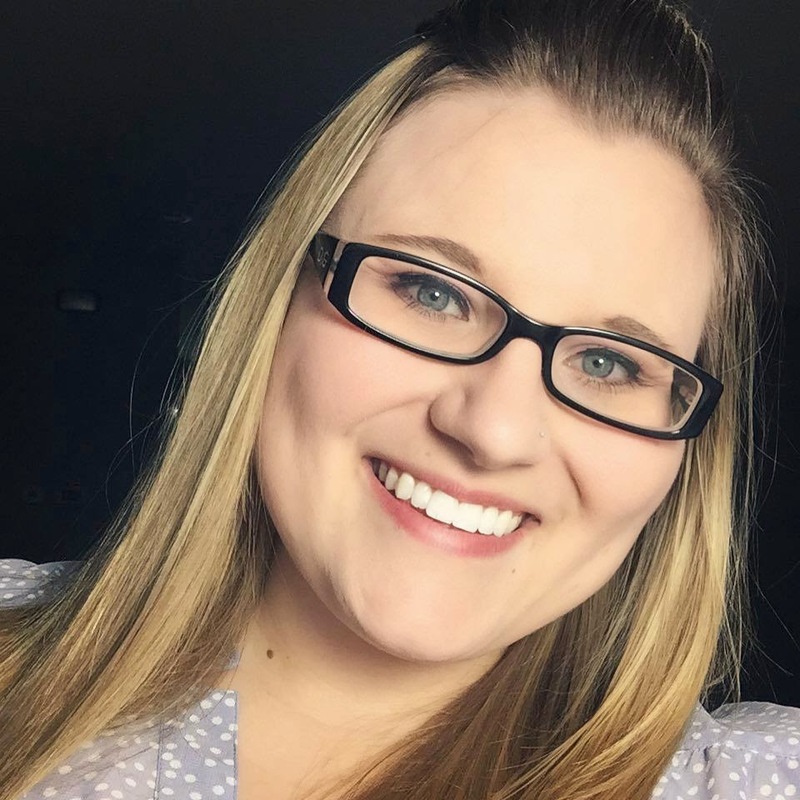 She told me that one of our fellow North Iowa Bloggers, Amy of Modern Rural Living, had passed away in a tragic multi-car accident that morning. I said "What!". Donna repeated it again, but I knew what she had said, I just couldn't believe it. So I said "What!" one more time. Donna knew I was in disbelief, just like she was, and though we were 50 miles apart from each other, she could tell what I was thinking and said, "I know." We just sat on the phone with each other mumbling disbeliefs back and worth, or even just saying nothing. But we knew we were there for each other and we knew we were there for the rest of our North Iowa Bloggers, Amy's fiance Spenser and Amy's parents and brother. One of the Facebook photos I posted of Amy and I. We were on a social media panel together just last month. That evening after Amy's name was released publicly, I shared photos of Amy and myself on Facebook. The support from my Facebook followers was amazing. 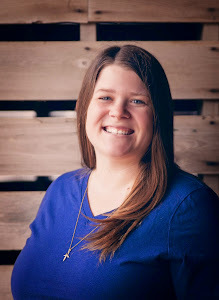 Those that didn't even know Amy sent their prayers for her family and friends - AND to the North Iowa Bloggers. I was astonished that people would be thinking of me during this time, along with the rest of my North Iowa Bloggers community. My Mom called me that night to make sure I was alright. She mentioned how lucky I was to have the North Iowa Bloggers. And that is when I think it really hit me, the North Iowa Bloggers was more than just a group of people that got together to talk social media and support our local community, we were friends. Living in rural Iowa, let's just say, there are limitations to finding friends. There isn't a huge population to begin with and then if you look for people that have the same interests as you, that pool gets even smaller. And I know and appreciate the friends I have, but the North Iowa Bloggers are something different, there is something special there, they're friends. Does that make sense to anyone else? They are an unbelievable support system that I am so lucky and fortunate to have, and Amy was such a big part of that. Amy was always so welcoming to anyone that joined our group, she had such an excitement and zest at every gathering and event we participated in, and her smile - what I can I say about her smile? Number one, she was always smiling. Number two, her smile instantly made you feel comfort. Number three, you could tell what she was thinking by the way she smiled. So, I guess in the words of Amy, her smile "Rocked". 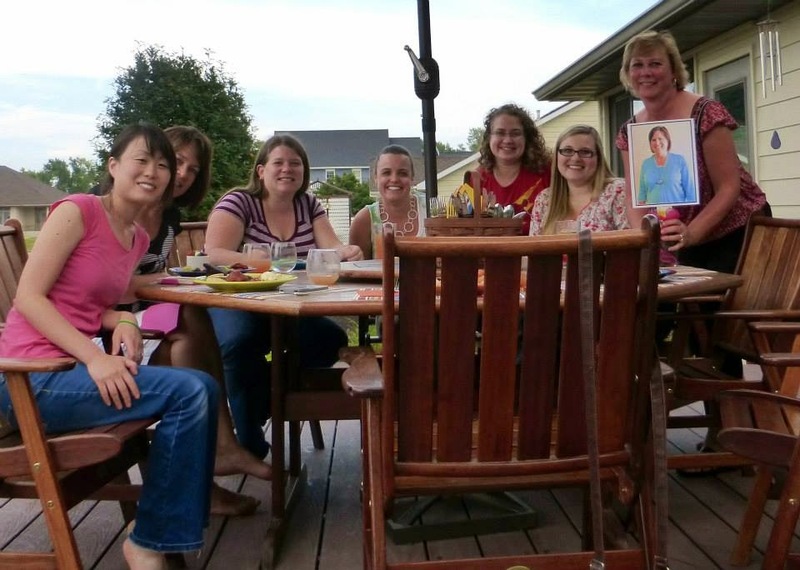 The North Iowa Bloggers, Spenser, Amy's family and the rest of her friends are going to miss her smile and friendship for awhile. There are going to be holes in our lives and hearts for awhile. But the promise of Easter gives me assurance that I will see that smile again. Scripture always gives me so much fulfillment and I ran across this verse that I think embodies Amy, plus goes well with some of the things My Farmer and I have been praying with each other about this Lent. What words or songs of support do you turn to in time of loss? 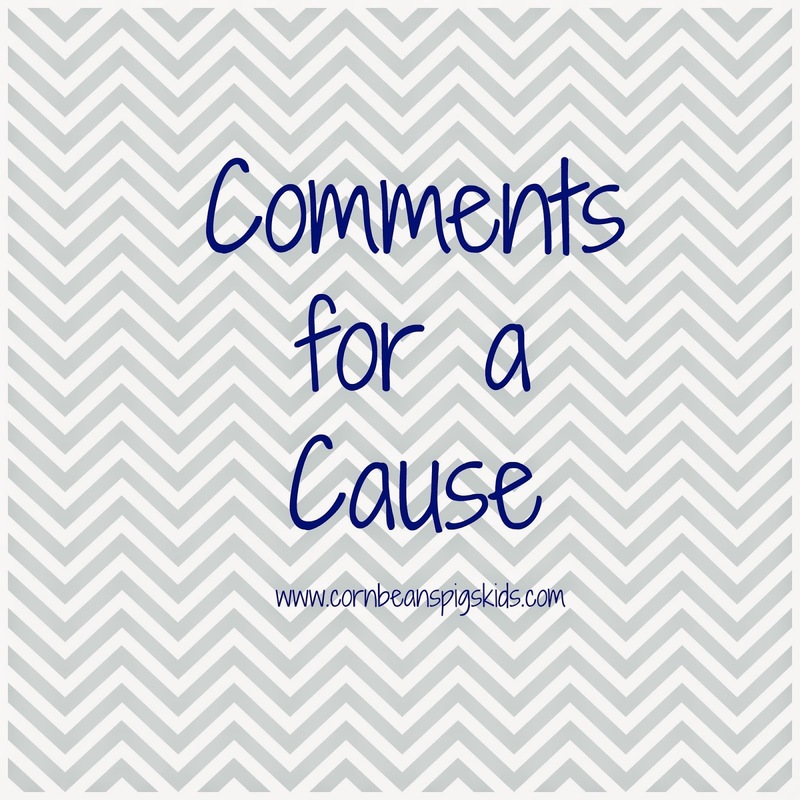 Remember to Comment for a Cause (and be sure to check out next month's Comments for a Cause tomorrow - I'm doing something special for Amy! ), and be sure to check out these other great tributes to her. We invited all of our family to our house after church for dinner and our son LP's birthday party. While we were waiting for the homemade ice cream my Mom captured a couple photos of my girls' sisterly love that I am blessed to see everyday. And I just had to share with you today. What are some blessings in your life? Remember to Comment for a Cause! 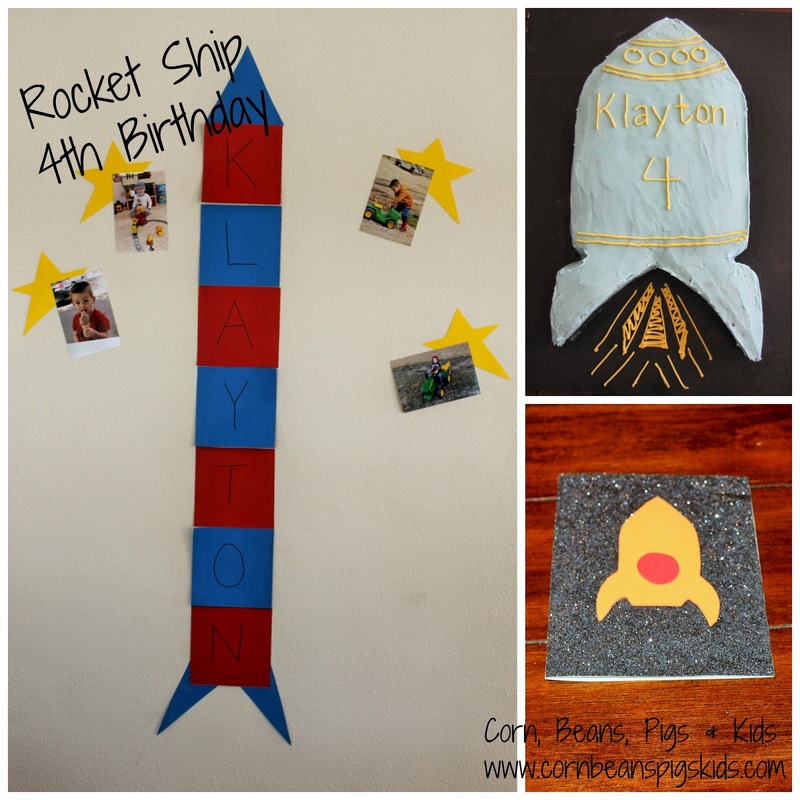 Blasting Off to LP's 4th Birthday! Today our son, LP turns 4 years old! My Farmer and I talked today about how we can't believe we have a 4 year old in our house, but at the same time it seems like he has been apart of our family for a long time. LP is a curious and busy boy who loves to use his imagination. He loves building things about of old containers and cartons, paper, really anything he can get his hands on, and he has been building a lot of robots and rocket ships lately. So, at the beginning of the month when we asked him what he'd like his birthday cake to be this year we didn't really know what he'd say. He excitingly said - a rocket ship! We had a great time celebrating with family this past Sunday. The first thing I always do is work on the invitation. LP loves doing crafts, so making the birthday invitations with him was a great activity for the two of us. We used a lot of materials we had in our craft supplies but did splurge and bought some black glitter paper to make the invitation out of this world. For each card I cut a rocket ship and a porthole out of foam, that LP then assembled together. 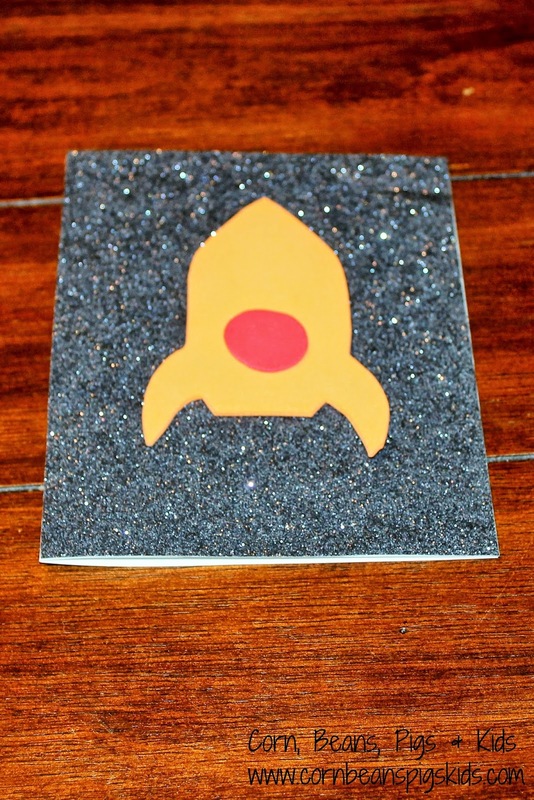 We then put the black glitter paper on the front of each card and LP then stuck down the completed rocket ships on top of the card. For the inside, I wrote the party's information on one side and LP drew a rocket ship on the other. We put all of our invitations together in just an hour and had a great time doing them! The next thing I got ready for the party was the decorations. For all of our kids' birthday parties I like to do something simple to help show the "theme" and also to show photos of the child throughout the last year. 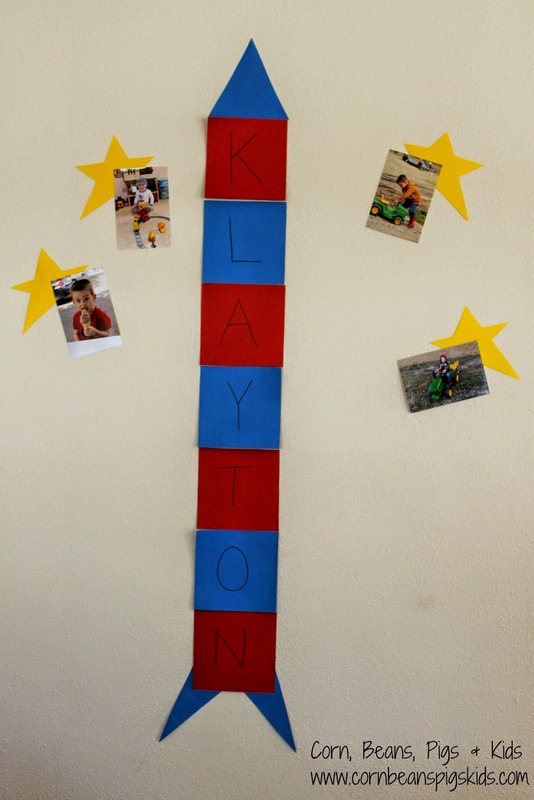 We've been working a lot at home on name recognition and letter recognition, so we made a name rocket. I then showed LP around a dozen photos of him over the past year and he picked his favorite four to put on stars. The final thing to take care of, and probably the most important was the food! We actually had our baby daughter JP's baptism Sunday morning at church, so following church we had everyone to our house for crockpot chili and crockpot chicken and dumpling soup. I also made an overnight salad and shrimp pasta salad to serve on the side, along with beer bread, corn muffins and crackers to go with the soup. Following dinner, we opened presents and then had cake and homemade ice cream! 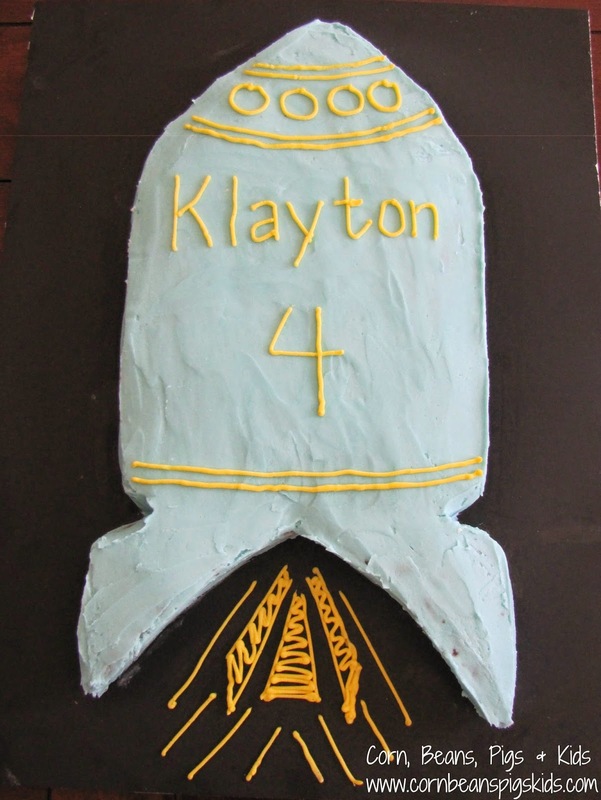 To make LP's rocket ship cake I made a 9x13 chocolate cake and simply cut the top at a curved angle to make the point of the rocket, and then I moved those two pieces to the bottom of the cake to make the fins on the bottom of the rocket. What was your favorite birthday party theme as a child? Remember to Comment for a Cause! Yesterday I got the opportunity to meet these two, along with many others, as I participated in an Anderson Erickson Dairy immersion day, since I am a 2015 AE Dairy Blog Ambassador! 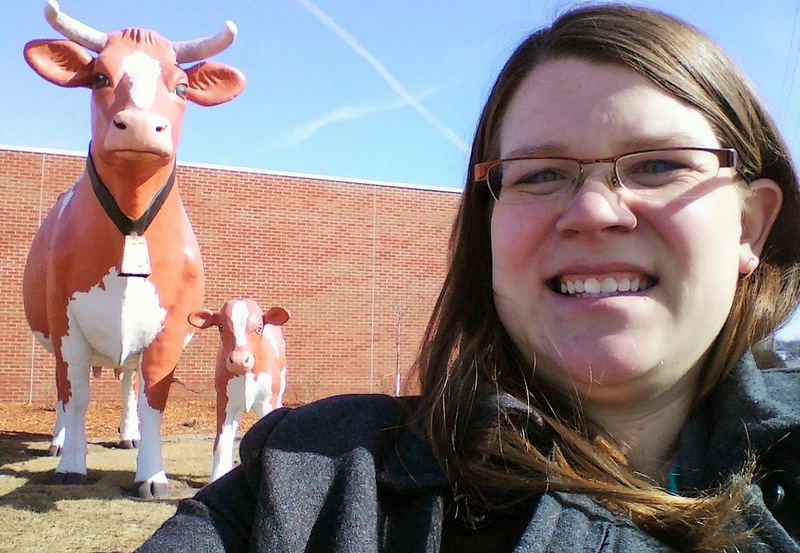 I had a great time learning about the dairy's history, going on a tour and participating in a taste test. I started the day off by having breakfast with Miriam Erickson Brown, President and CEO of AE Dairy, and Kim Peter, Director of Marketing. 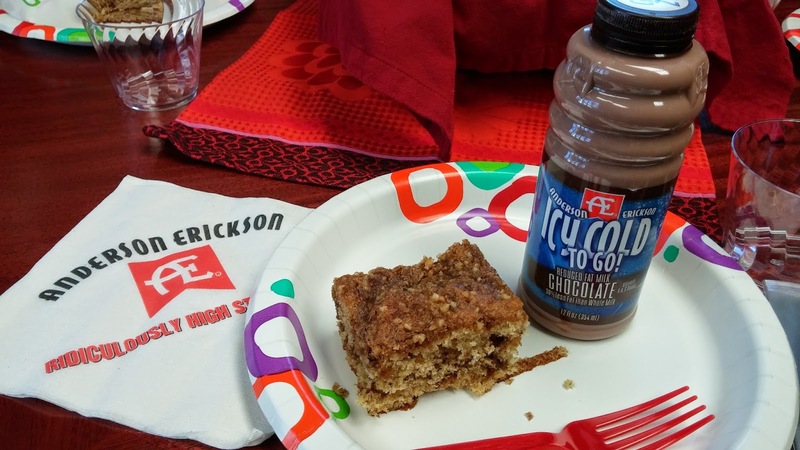 There was of course plenty of AE products to choose from and I opted for some chocolate milk and a piece of buttermilk streusel coffee cake. I loved hearing Miriam's passion for dairy as she shared her family's dairy's story. Her grandfather, Iver Erickson, and friend William "Andy" Anderson, bought a dairy for $15,000 and started AE Dairy in 1930. At that time there were around 150 dairies in Des Moines, so after awhile the dairy decided to concentrate on specific dairy products - milks, cottage cheese and sour cream. Andy Anderson was interested in butter, so he decided to go off on his own several years later to Minnesota and sold his shares of the company to Iver. In the 60's Miriam's Dad, Jim got involved with the dairy and helped develop the company's yogurt line. Yogurt was only found in health markets at that time, and Jim helped bring yogurt to grocery stores. Today, Jim is the Chairman of the AE Dairy Board, Miriam is the President and CEO and her brother Warren is the COO and CFO. After breakfast Miriam and Kim introduced me to John Just, Quality Assurance and Research Director, who led all of us on a tour of the 22 acre dairy. This is where I learned about the over 25 lab and sensory tests done at various stages of the dairy products - from the initial stage of raw milk straight from the tanker truck, to tests ran on samples after the pasteurization and homogenization processes (like seen in the photo above and thanks to Annie for posing for me), to even tests ran after products reach their sell-by date. Right now they said that over 99% of their production meets the end-of-code date. One test I was lucky to participate in yesterday was their weekly taste test - a tradition since AE Dairy began. Every Thursday at 11 a.m. members of AE's research, sales and leadership teams come together to test the previous weeks' production and to judge its taste, smell, texture and appearance. It was fun talking with everyone around the table as they talked about new flavors (by the way, check out their new Hot Jalapeno Mexican Style Dip), product ideas in the pipeline and products that flopped. It was also a great chance to try some products I probably would have never bought myself. Before yesterday I thought I only liked Greek Yogurt in a tzatziki sauce on top of a gyro. But now, I'm going to have to start buying some of AE Dairy's Greek Yogurts to keep stocked in our refrigerator. I think my favorite was the Almond Creme flavor. As a farmer, I found it really interesting to talk to members of the AE Dairy team about questions they receive from customers about animal treatment, to raw milk, to hormones in milk. I may not be a dairy farmer, but as a livestock farmer, we all have concern and care for our animals. As a Mom, I love the versatility of dairy, along with its great health benefits. I know between drinking a glass of milk, to incorporating cheese into a sauce, to having cottage cheese as a snack - that my family has dairy at every meal of the day. I could keep going on and on, but I'll stop for today. But I'll keep sharing about AE Dairy's story and their recipes throughout the rest of the year. What is your favorite dairy product? What dairy product do you enjoy cooking and baking with the most? I'll be sure to keep your favorites in mind for future recipe posts! Remember to Comment for a Cause! And, if you are a AE Dairy fan who grew up enjoying AE products and moved away, or if you got a taste from a friend or family member and fell in love from a distance, you need to apply for AE Dairy's long-distance fans contest for your chance at a special prize pack full of AE Dairy items shipped to you! You can apply yourself or you can nominate someone you know who would love a taste from "back home". Today is Ash Wednesday, the first day of the Lent season. Lent is a time for prayer and repentance of sins, as Christians prepare for Holy Week and the celebration of Easter. 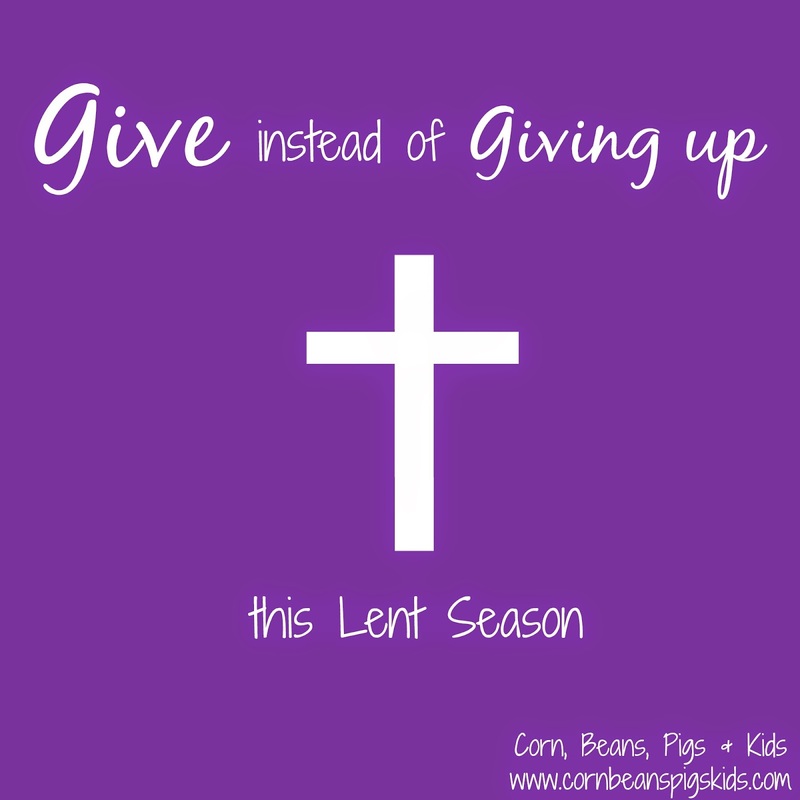 A common practice during Lent is to fast or give up certain types of luxuries. Now I may ruffle a few feathers here, but I am not a fan of this tradition. I realize that fasting and giving up something is suppose to help you grow closer to God, and in a way symbolize what Jesus Christ did for all of us during Holy Week. But there is no way we can even come close to the same giving up of ourselves that Jesus Christ did for us on the cross. And are you telling me that people that give up alcohol, chocolate or swearing during Lent are really doing that in recognition of the glory of God? That is why today, on Ash Wednesday, the first day of Lent, I am challenging all of you to Give of yourself in the glory of God. So what are some ways we can Give this Lent you are now asking? Well, here is a list of a few ideas I have and I'd love hear your ideas. Remember to Comment for a Cause! Practice daily devotions and share your insights with your spouse, children, friends, etc. 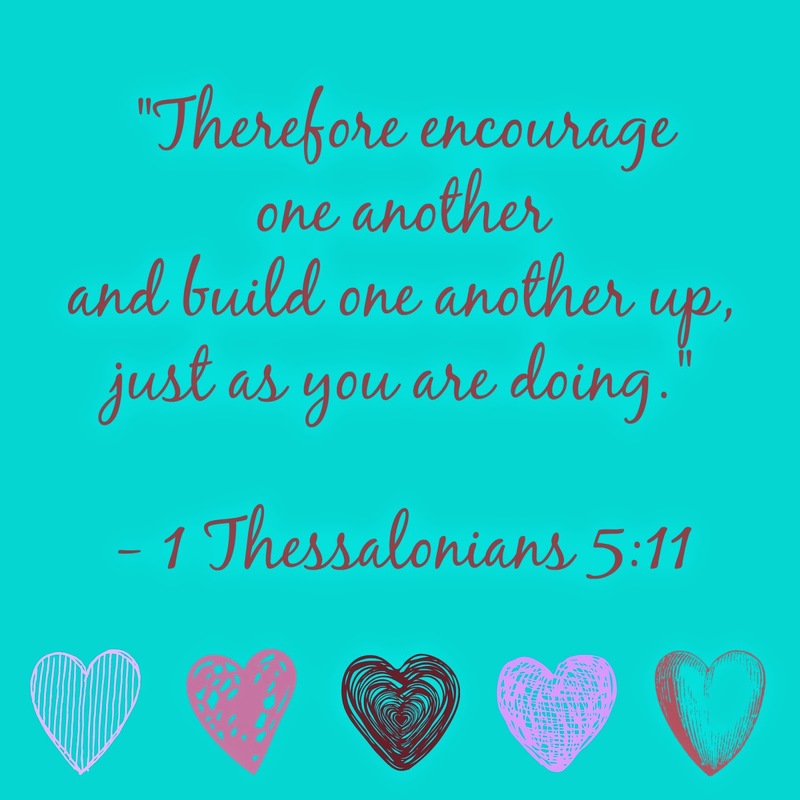 Start a prayer team with a friend or family member. Send each other a text or call each other every day and pray with and for each other. Volunteer at your church or in your community. Help feed the hungry, clothe the naked, visit the sick, etc. I hope you all have a blessed Lent! When we were dating we were learning something new about each other every day. Now we finish each other's sentences and know what the other is thinking by just looking at them. There was a lot of romance in those early days and now if someone does something romantic for the other it seems to usually fall on a holiday. It would take My Farmer and I at least 30 minutes to say good-bye to each other when we were dating. Now, we give each other a quick kiss and say "see ya later - love you" before he leaves to do morning chores. When we were dating My Farmer and I would dream about raising kids on a working farm and today we have dreams of our kids continuing our farm with the next generation. There are things I miss about that young love but things I definitely would never trade for the love we have today. What do you think of when you think about new love and old love? Remember to Comment for a Cause! the situation stopped being stressful." How do you find peace in the midst of chaos? (Please tell me my house isn't the only one that can look like this... I'm just glad JP can sleep through/in it!) Remember to Comment for a Cause! Today JP turns one month old! Part of me thinks "Wow! She's already a month old! ", while the other part of me feels like she has been part of our family forever. To celebrate her being a month old today, I thought I'd share how we celebrate BIRTHdays in our family. Sibling Gifts: Big Brother and Big Sister gifts can be as big or little as you like. First, we (Mom & Dad) always give the new sibling(s) a big brother/sister shirt they can wear at the hospital. Second, the new baby gives the older sibling(s) a gift the first day at the hospital. 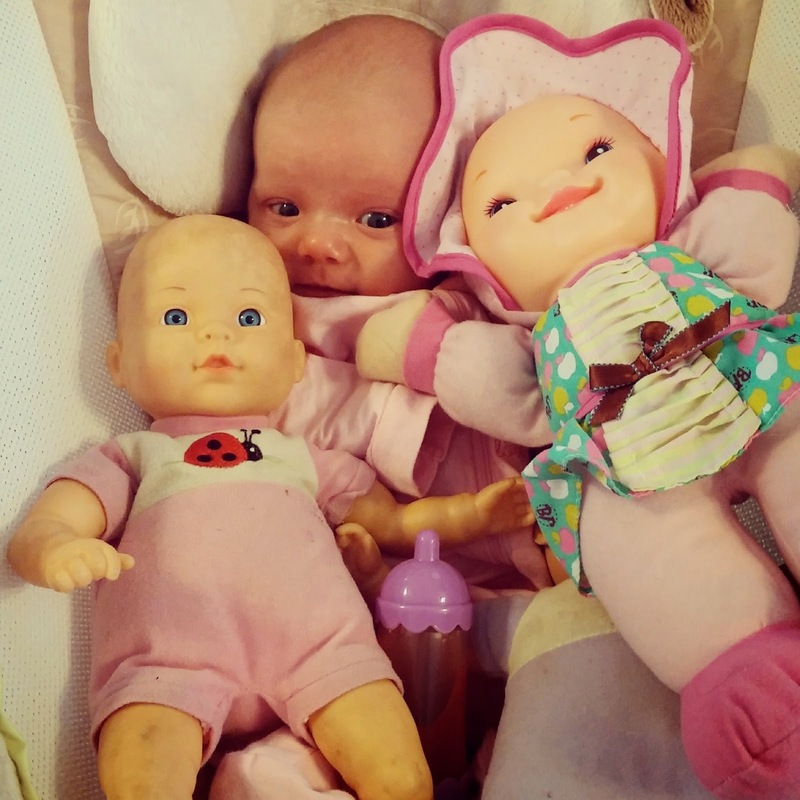 We always tell our kids that the baby feels so lucky to have them as their older sibling that they brought them a gift. The sibling gift starts with a special bag (when MP was born our son LP received a John Deere backpack he'd been eyeing for a couple of months, and this time when JP was born both kids got personalized Cinch Sacks). The great thing about these bags is that they are reusable and can not only store all of their things at the hospital, but wherever and everywhere after the baby is home. Inside the bag we include a new book, activities (such as coloring/sketch books, games, cards) to do at the hospital, and snacks for the hospital. Both LP and MP really enjoyed their cameras in their bags from JP. We got LP a disposable camera (which he actually did take a few good photos) and MP a play camera. Share Family Photos: Make sure to bring a family photo or a photo of your older child(ren) to the hospital to display. This way your older child(ren) know that this is a special time for your entire family. We have always put a photo of the older sibling(s) in the baby's hospital bed. We tell them that that baby loves looking at their photo, and that all of their nurses and doctors know that they are the baby's big brother/sister. 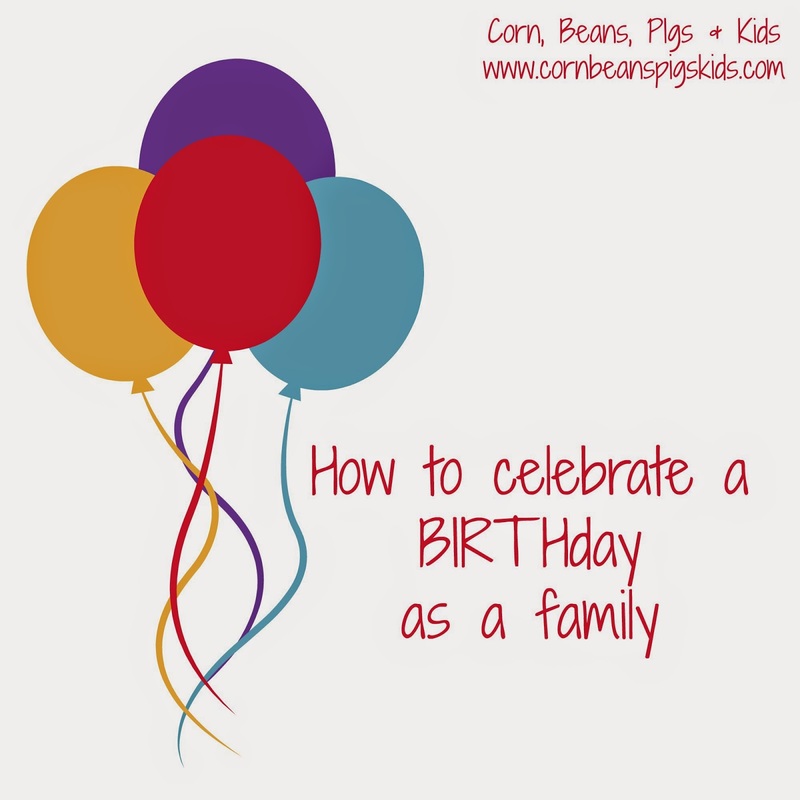 Throw a BIRTHday Party: What kid doesn't like a birthday party, especially if they get to help plan it? On the first full day in the hospital we have a BIRTHday party complete with cake and ice cream picked out by the older sibling(s). The morning of the first full day My Farmer takes the kid(s) shopping for a going home outfit for the baby, a cake and ice cream (and sometimes whatever else they deem necessary while out shopping...). We tell all of our visiting family that cake and ice cream will be served all day to celebrate and the older sibling(s) are the host(ess) of the party. They welcome everyone to the party and get the special role of introducing their new baby sibling to guests. Be sure to sing Happy Birthday too! Those are three simple ways we celebrate the arrival of a new family member. What are some things your family has done? Remember to Comment for a Cause! I was raised to always be thankful and to write thank you cards. And even though I might be a little late or more belated than I'd prefer to be, today I'm writing a letter of thanks to Lindsay from Agricultural with Dr. Lindsay for the thoughtful gifts she sent me through the Christmas in the Country blogger/agvocate gift exchange. Lindsay did her research - or as she referred to it, stocking ;) First thing she gave me was a bacon cookbook! I am proud to be a hog farmer. My Farmer and I actually make our own bacon, so this cookbook has been fun to go through and pick out new recipes to try with our bacon. Second, she gave be a beautiful cross. I love the colors of it! And third, she made my entire family ornaments. She made hot chocolate ornaments for LP and MP and made ornaments with confetti in them for My Farmer and I. My favorite ornament was one that says "Corn, Beans, Pigs and Kids" on it! They were all very thoughtful and fun to receive. So thank you Lindsay for the beautiful gifts that brought a smile to my entire family's faces. Besides receiving a gift, I also sent a gift. It was a lot of fun to be partnered with an agvocate from Hawaii! Now I have to admit, when I first saw the name and address of Rhonda, I thought what could a person from Iowa possibly give a person from Hawaii! But then low and behold I discovered Rhonda calls Iowa home, so I thought what better than giving her some Iowa foods. She told me that it hit the spot, as her family was feeling home sick. I had never participated in a gift exchange like this before and I had such a great time doing it, that I'll be sure to do it again next year! Have you participated in an online "Secret Santa" gift exchange? Remember to Comment for a Cause! Wordless Wednesday - Let's Play! What was your favorite thing to play with your siblings? Remember to Comment for a Cause! It is a new month and time for a new cause to support. But before I get into the details for February, I'd first like to talk about last month. During the month of January I had 44 comments, creating a donation of $22 for the Battle of the Badges, that supports Make-A-Wish Iowa. If you'd like to see how the event went check out my friend Donna's (from DonnaHup.com) review of it. In the month of February I am teaming up with my friend Beth Ann from It's Just Life to support Room to Read. 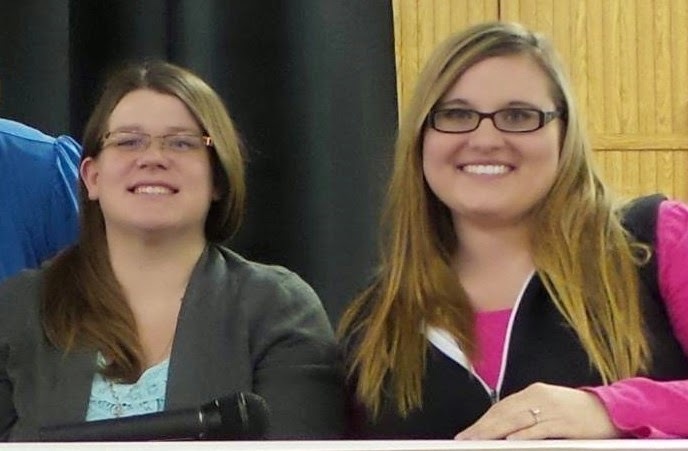 Beth Ann and I both have a love of reading and February is Library Lover's Month, so we had to celebrate through a cause that supported childhood literacy. So for every comment made during the month I'll be donating $0.50 to Room to Read. Room to Read is a great organization that promotes childhood literacy worldwide. They also work hard on gender equality in education. There is an estimated 773.5 million people worldwide that lack the ability to read and write, and out of all those illiterate people, two-thirds are female, and over 90% live in developing countries. This is where Room to Read comes in to help. Room to Read is located in 10 countries in Asia and Africa. They have programs that focus of girls' education, building schools, starting and filling school libraries, reading & writing instruction, etc. A neat fact is that there have been over 9.7 million books checked out from Room to Read libraries. Another thing that makes this organization an A+ in my book is that over the last 8 years they have had a Charity Navigator rating of 4 stars. This means the organization is spending the majority of their dollars on their cause and not on overhead and management costs. So get involved and comment all month long to help this great organization making a difference in the lives of over 8.8 million children so far, with goals of surpassing 10 million children this year! How are you going to celebrate Library Lovers Month? One way Beth Ann and I are celebrating is by helping Room to Read's Library Initiative through Comments for a Cause! Country Fair Blog Party: L.O.V.E. 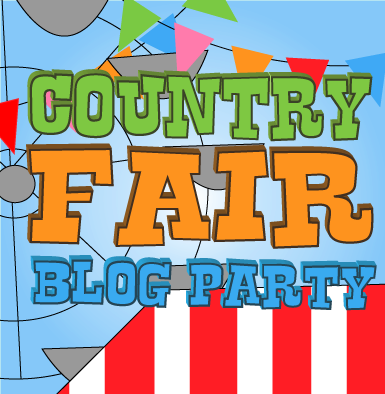 It's the first of the month and time to start a new Country Fair Blog Party. But before we talk about this month's party I just have to say that I had so much fun being a co-host of the blog hop last month! My favorite post from January was Tip Garden's Gram's Hot Chocolate Mix. I had been looking for the perfect homemade hot chocolate recipe and this one did not disappoint! My kids and I made a big batch last month which has come in handy on cold days. I can't wait to see what great posts get linked up this month as celebrate L.O.V.E. Throughout the month of February we are looking for your posts about anything that you love or who you love. Do you have a product that you love or a place you love to shop? How about a place you love to travel to? Or a recipe that makes you think of the one you love? We love the endless possibilities of L.O.V.E. Can you feel the LOVE in the air? This blog hop is a great opportunity to check out new blogs, and if you blog yourself, have your posts reach a new audience. 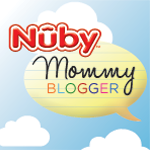 Bloggers, feel free to link up to 3 posts this month and be sure to visit some other party goers and let them know you are stopping by through the Country Fair Blog Party. We're excited to see everything you share this month! 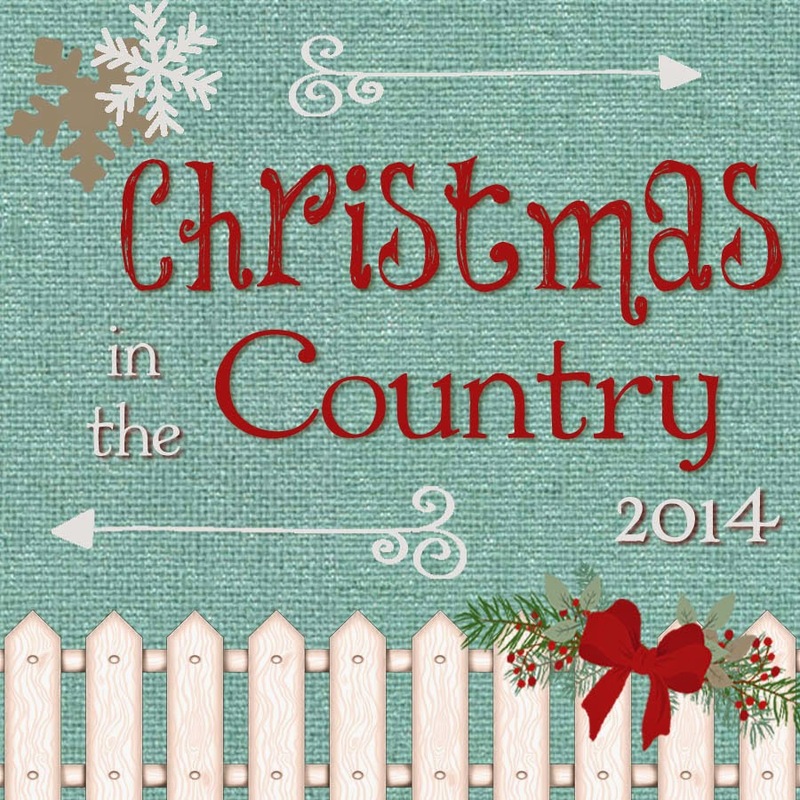 What new blog did you discover through this month's Country Fair Blog Party? Remember to Comment for a Cause! How do you like my train of thought today? Well today is the Super Bowl and we're snowed in. Even though our family could care less about who wins today, it is a great excuse to make some tasty snacks! This is an easy snack you can throw together last minute, with ingredients, that if you're like our family, always seem to have on hand. Give tater tots a rough chop, cutting them so they retain some size and texture. Put in mixing bowl and add bacon, sour cream, 1 cup cheese and seasoning salt. Stir to combine. Transfer mixture into greased 8x8 or 2 qt. baking dish. Top with remaining 1 coup of cheese. Bake for 30 minutes at 375F, or until top is bubbly and golden brown. Serve immediately with crackers or tortilla chips (or a spoon!). This dip could also be served as a casserole. What are you having tonight to eat during the Super Bowl? Remember to Comment for a Cause!